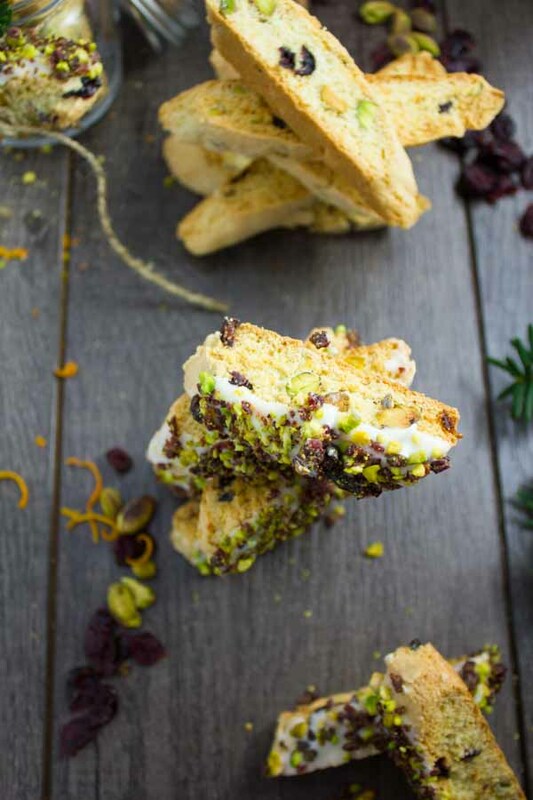 Up your Christmas baking game with a batch of these Italian Cranberry Pistachio Biscotti! 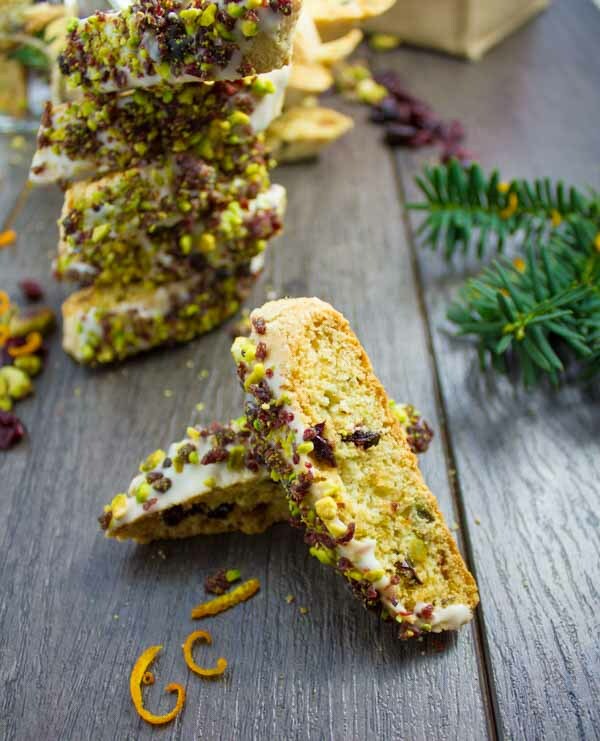 They are dipped in white chocolate and sprinkled with chopped pistachios and cranberries for the festive taste! It feels a bit too early to start talking Holiday baking. However, I just wanted to give you a heads up with this pure JOY of a Holiday cookie exchange recipe. It’s tastes, feels and looks like the Holidays! Lately, our cookie exchanges have all been “kiddie” friendly because the girls love baking with me. But that also means our baking has been typical anything chocolate. This year I’m hosting two Holiday cookie exchange parties, so everyone will get their cheer! 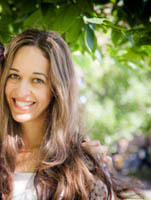 And this Holiday biscotti recipe is my pick. Here’s why. These Cranberry Pistachio Biscotti are light as air, easy to whip up and taste like pure Holiday joy! 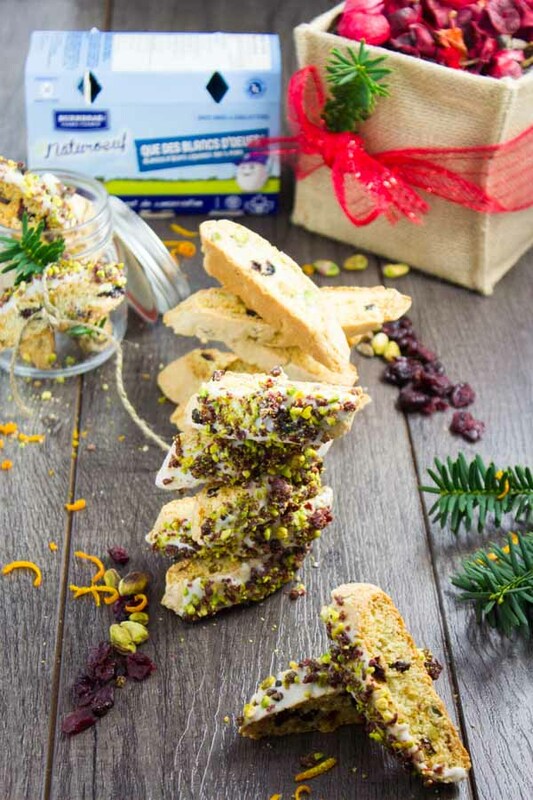 These authentic Italian cookies have a fabulous crunch, a sweet cranberry and pistachio taste with a spike of orange. For a more festive feel, half of them are dipped in some melted white chocolate and sprinkled with more crushed cranberries and pistachios!! Oh yes, your Holiday cookie exchange this year is about to get super delicious! The colors, the flavors—cranberry, orange, and pistachio! These biscotti scream festive! It’s a cookie that stores well for a long time—at least 2 weeks, and so it makes great Holiday gifts too. The biscotti batter is made without butter, just a touch of oil, and with egg whites only. Egg whites instead of whole eggs also add such a perfect crunch. It’s a recipe you need to try this Holiday season! Now yes, I mentioned these Cranberry Pistachio Biscotti are light as air. Which is why we can totally afford to dip them into white chocolate. I mean we’ve skipped the butter, we’re using only egg whites, but it’s still the Holidays. And not only are these dipped into chocolate but also sprinkled with finely crushed cranberries and pistachios for the red and green Christmas look. 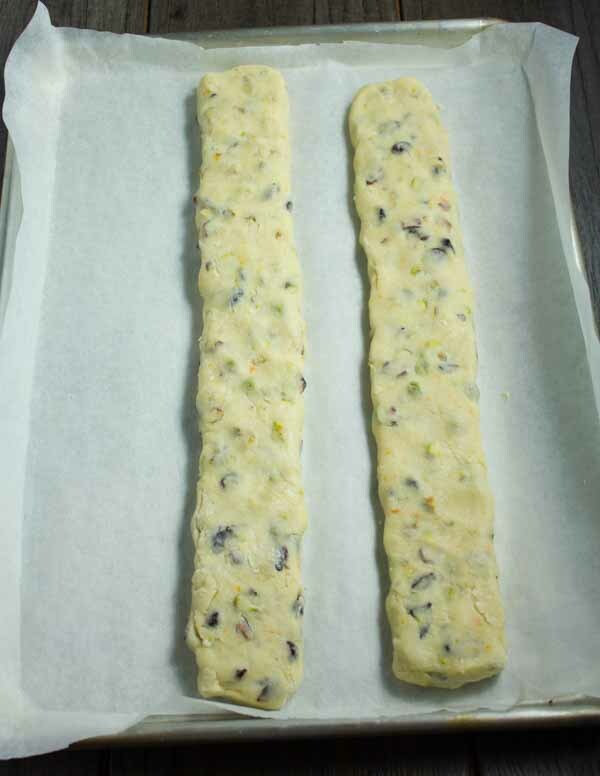 Here’s the step by step breakdown of this cranberry pistachio biscotti recipe! You’ll add sugar and orange zest in a bowl, add in some oil and egg whites. 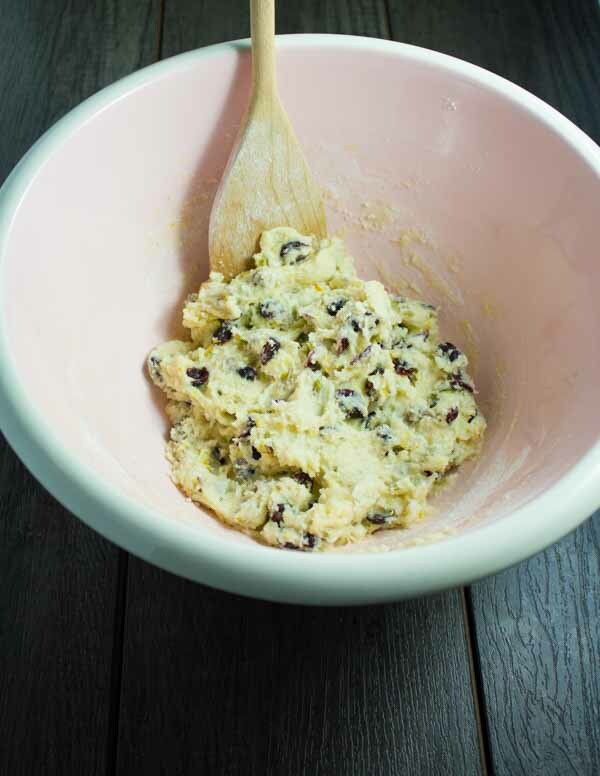 Use a simple a wooden spoon to mix everything, then go in with the flour and baking powder mixture. Use the same wooden spoon to combine and halfway, add in the cranberries and shelled pistachios. Continue to stir with the wooden spoon until all mixed up. Now you’ll divide the biscotti batter in half and form a log with each half. Here’s the trick: I made those into small-medium sized biscotti and that’s why I made 2 logs. If you want bigger bakery style biscotti, then use the dough to make only one log. And if you want those mini cute looking bucatini cookies then divide the dough into 3 or 4 logs. Then you’ll flatten the logs on top with your hands gently and they hit the oven. After baking, the logs are sliced diagonally into 1/2 and inch thick slices. And here’s another trick—the sharper the angle you slice the log at, the longer your biscotti will look, while the smaller angle you slice on, the smaller your biscotti will look. It’s a personal taste, and I’ve made both options here so you can see most of the dipped biscotti are sliced at a smaller able, who the plain ones are sliced at a bigger angle so they look taller. 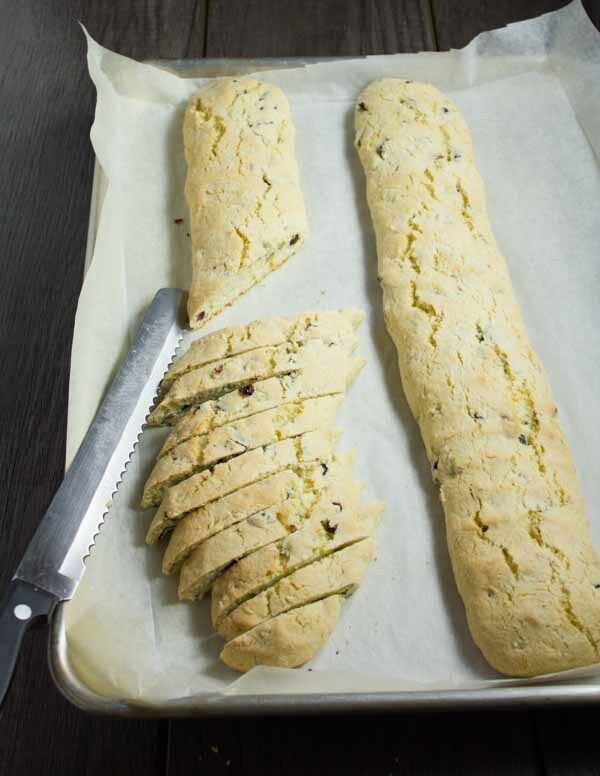 Once sliced the biscotti slices goes back into a lower oven for 12 minutes to crisp up. And now the fun part. It’s optional but really worth it. Melt the white chocolate in a microwave-safe bowl and dip the tops of each cranberry pistachio biscotti into the white chocolate. 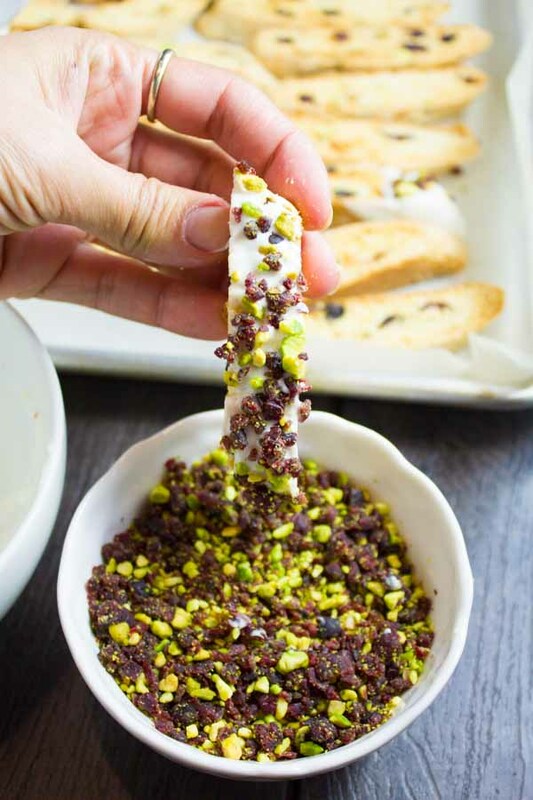 Then dip your biscotti into a bowl of crushed cranberries and pistachios. Let the white chocolate set at room temperature or in the fridge for a speedy set up. Now grab your friends, wrap some Holiday biscotti gifts for them, make some coffee and enjoy!! For small-medium sized biscotti make 2 logs, like in the pictures. If you want bigger bakery-style biscotti, use the dough to make only one log. If you want those mini cute looking bucatini cookies, then divide the dough into 3 or 4 logs. The sharper the angle you slice the cookie log at, the longer your biscotti will look. I recommend using a mini food processor to finely crush the cranberries and pistachios. 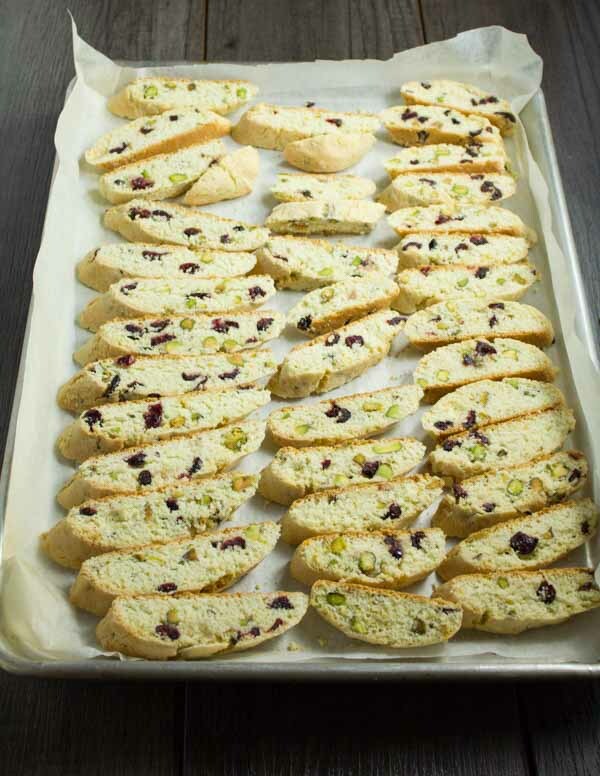 Up your Christmas baking game with a batch of these Italian Cranberry Pistachio Biscotti! They are dipped into white chocolate and sprinkled with chopped pistachios and cranberries for the festive look! 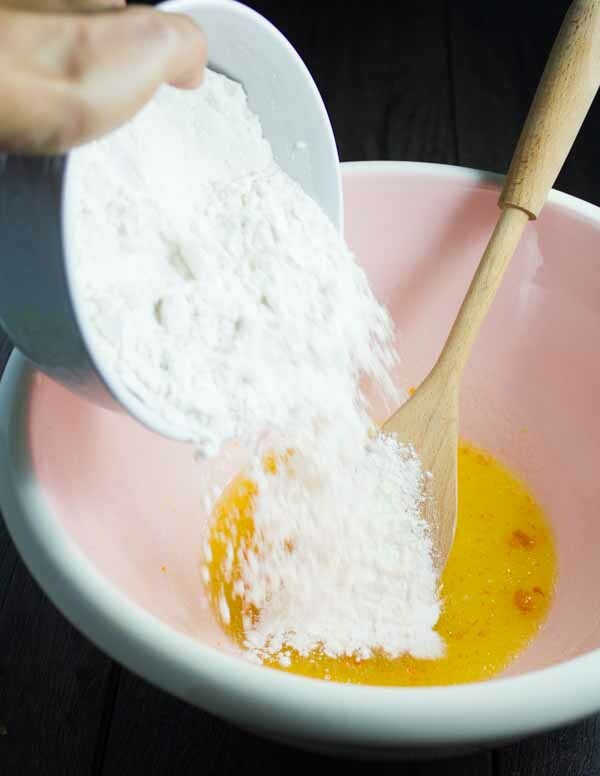 In a small bowl, add the flour and baking powder and mix them well. 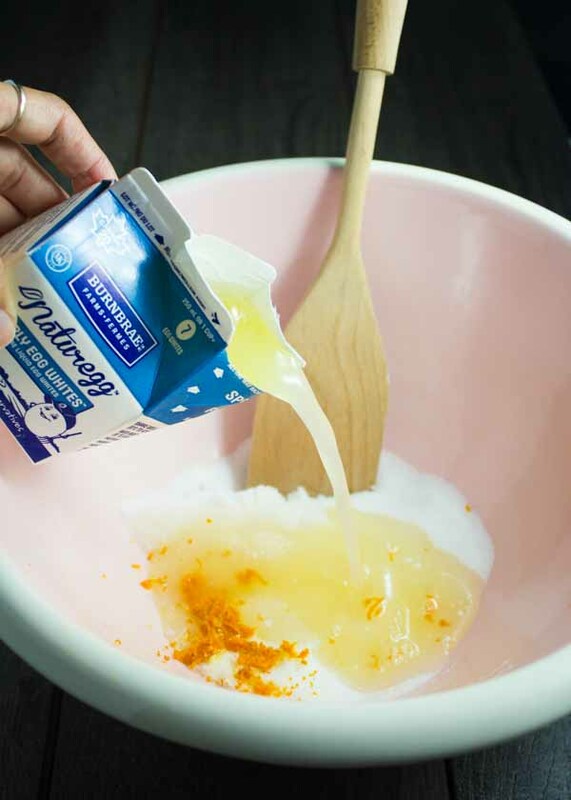 In a large bowl, mix the sugar, orange zest and oil using a wooden spoon or whisk. Add in the egg whites and mix well. 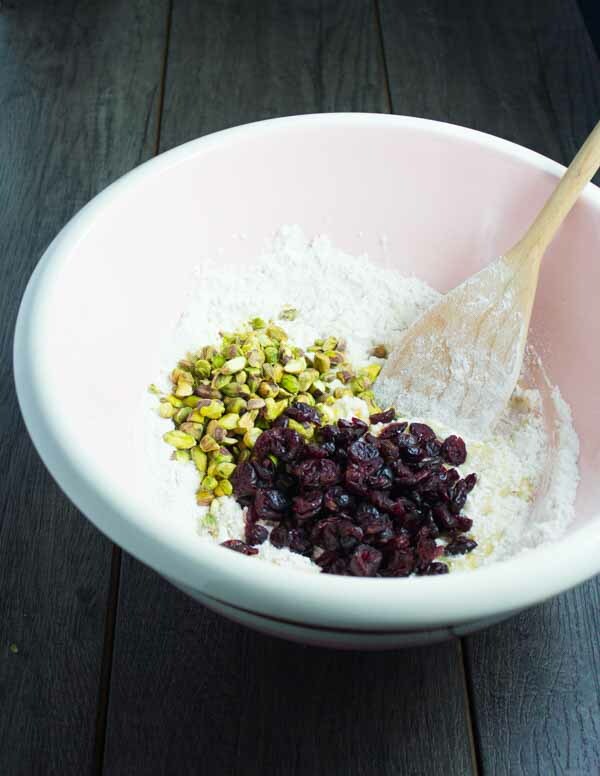 Add the flour mixture to the sugar mixture and using a wooden spoon mix them, and halfway add the pistachios and cranberries and then continue mixing until the cookie dough is ready. Divide the cookie dough into 1 or 2 or 3 or 4 (depending on the size of biscotti desired) and shape into a log ( or 2 or 3 or 4 logs depending on size you chose). Press the tops of the log gently to flatten it and bake the cookie log for about 25 mins until slightly golden and set. Remove the cookie logs from the oven and use a sharp serrated knife to slice the cookie log diagonally into half inch thick slices. Place the biscotti slices back on the baking sheet and bake at 325 for 12 mins until crips ( the biscotti will harden as it cools down). Melt the white chocolate in halfway bowl for 1 min. Place the pistachio and cranberry mixture in another bowl. 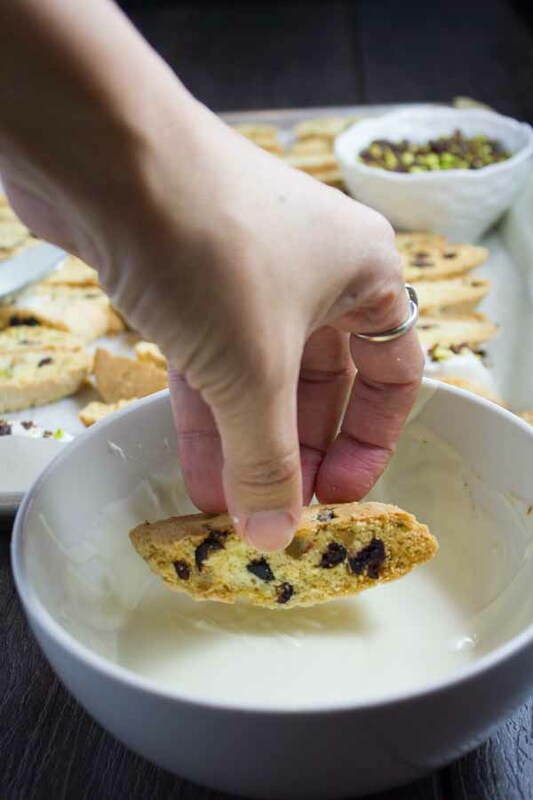 Take each biscotti and dip the top of it in the white chocolate mixture allowing the excess chocolate to drip off. Then dip it right into the crushed pistachio cranberry mixture. Thanks so much!! They’re absolutely amazing for the Holidays, and any day! So true Jessy–I gift them all the time and I get big Thank You’s 🙂 Hope you make them this year! I don’t usually cook with orange zest so I’m not sure how much to use! Can you help me out here? Hi Nancy, if you zest half an orange, you’ll end up with roughly a tablespoon of zest. That’s all you need for a nice faint orange flavor–not too strong, but definitely a noticeable one. If you prefer lemon, do the same with a lemon. You can also skip the zest all together and use vanilla only:) It’s really a personal taste thing 🙂 Enjoy! I baked these tonight – they were outstanding. It’s not often that something I make looks exactly like the photo! Yaaay Evelyn! So happy you enjoyed these! 🙂 They’re my favorite!! Happy Holidays! My dough is crumbly. What went wrong? Hi Theresa, some times the type of flours can differ. If you feel your dough is dry and won’t hold its’ shape, just add a touch more of the egg white–about a tablespoon at a time. you shouldn’t need more than two tablespoons.